This was my third time in Turkey and by far the shortest. I only had two days in ancient Constantinople (and I was just in that region), between my fabulous time in Austria and the flight to Ashgabat. As I’ve been teaching online all summer, and Summer Session II ends today, I spent most of the past two days reading and grading papers, exams, discussions and just awhile ago, submitting grades. All this is to say that I didn’t do much in the way of the tourist activities in town this trip. I did make my pilgrimage to the Hagia Sophia, though, and today’s pictures are in the photo gallery. Walking around town a bit brought home the importance of returning to places at different times of the year and over years. Especially in cities where there are continual renewal projects, as some of the very impressive monuments can be covered with scaffolds. Last year the well in the Hagia Sophia was completed covered for renovations, this year it is open and the bright gold gild glitters in the sun. On the other hand, the German Fountain on the Hippodrome that was built in ca. 1900 to commemorate Wilhelm II’s visit to the city, is now covered, while last year we spent time enjoying it. It is also just fun to come to a large city like Istanbul, and within a short time, be able to remember how to get around, including where the post office is, where the best place to stock up on camera batteries is, and where not to eat because it’s a rip off. As with every major city, there are scams all over. I luckily wasn’t affected by any of them, but at the hotel and in town, I heard from two other people who were. They are worth repeating as a cautionary note because both are fairly typical scams. The first involved an American guy who was walking down a street with hardly anyone else around. The one guy who was coming in the opposite direction dropped something, I can’t remember exactly what it was, but he stopped picked it up and gave it back to the fellow. The man was very grateful to have his belonging back and as a way of giving thanks offered to shine the American’s shoes. SCAM, he shined the shoes, which were sandals and didn’t need polishing, then charged an outrageous amount for doing so & insisted on payment. The second was with an Algerian gentleman who met another somewhat younger man in a café and offered to show him the city. He went with him to a disco about 20 km outside of town, but keep insisting that he didn’t have any money and he couldn’t drink (it is Ramadan after all), so all he was going to have was one Coke. His ‘friend’ said that was fine, and that they would split the bill. Well, sooner or later a few girls arrived and even if the Algerian gentleman insisted he wasn’t interested and he didn’t have any money to entertain the women, they persisted until he just up and walked out. They then presented him with a Euro 160 bill, of which he was supposed to pay half. He paid, realizing that fighting it and causing a stink could land him in more trouble. That’s one expensive coca-cola! While lucky on this trip, I did get scammed two years ago in Spain. My daughter and I were walking behind the cathedral in Toledo and a 50ish aged woman with a twig of rosemary came up to me and insisted that I take the twig for the benefit of my daughter’s health. As I didn’t want to take it she more of less forced it into my hand, but once there, demanded E10 for it. Giving it back was clearly not an option as by this time her friends had surrounded us. I ended up paying good money for nothing and felt incredibly stupid for a long time afterwards as well. My point with sharing these stories is that even experienced travelers as these two men and I are, get taken in by scams. There is always a need to be vigilant. On the other hand, part of travelling is meeting people and a certain level of trust simply needs to be there in order to engage in conversations and see things that would otherwise be entirely missed. 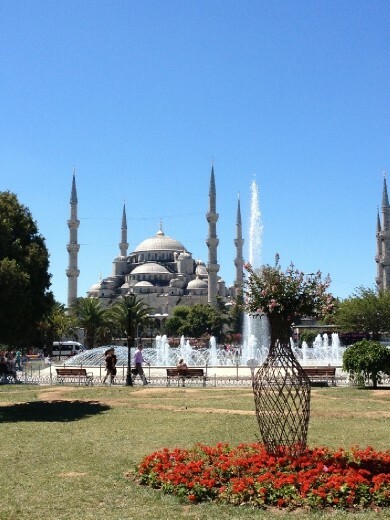 Istanbul is a great city. It is the intersection between Europe and Asia, and why Turkish politicians want to join the EU when they have so much more to gain from their crossroads status is beyond me. It is the perfect springboard for travel to Central Asia as the Turks migrated from the Steppes into Turkey and later the Mongolian hordes destroyed Turk centers all along the Silk Road. Much of this history is kept alive in Turkish Museums, esp. in old Constantinople as well as in the modern capital, Ankara.